Different. Gnejna Bay is only 1 km away from Riviera on the coast, however driving from Riviera to Gnejna will take you half an hour at least since there is no interconnecting roads. A decent beach, cleaned every day, not small, probably just a little smaller than Golden Bay, and its not very well known to tourists. You'll definitely have more towel space here! Some remote parts of Gnejna are also well known for nudists. Nudism is illegal in Malta, but apparently one eye is closed here. If you're adventurous enough to walk to the right side you'll find some other small sandy beaches, probably you'll be by yourself there. 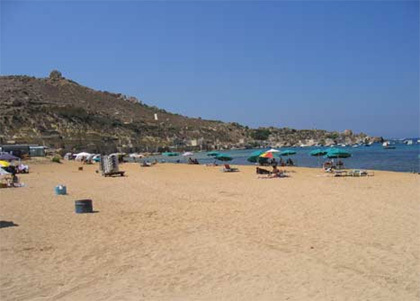 Gnejna is situated next to Mgarr. If you like cycling, then consider it. There is alot where to go from Gnejna by bike, so maybe you can finish your cycling day there. Looks wise,	Riviera looks better, but worth a visit. Getting there. Drive to Mgarr first, then follow signs to Gnejna Bay. I don't think it's possible to go to Gnejna by Bus, unless you stop in Mgarr and then walk 1 hour down the road. By bicycle is a good adventure, although you'll have to walk the hill back up! Facilities - Kiosks, food, ice cream, water sports, self drive boats, canoes.